Posted by Ryan Jerz on Wednesday June 25, 2008. I love the way arms look when throwing a baseball. Christy’s arm always looks like this.Over the past week our family endured what might be the first of many of these types of things. It was all-star baseball. And it’s not too easy on you. The Boy, as of last night, has completed his Little League career. He’ll move up to Babe Ruth next year, where they play on the big field. 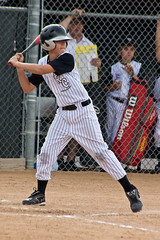 He has spent his career in Little League as a pretty good player. He was very good a few years, decent others. As we entered this year, he wanted badly to make an all-star team. It wasn’t going to be an easy task for him, as he was pretty much overlooked and unknown throughout Little League. I blame myself, really. We knew all the right people, but I didn’t put in the time coaching or talking him up; I always figured he’d get noticed when he was both good enough and it was time. It all came together for him this season. His coach really liked his ability and listened to me when I told him The Boy needed to work on his fielding. He had spent a lot of time playing first base (completely by choice), and I always disliked that. First base is where they put the guy who can hit but they want to hide in the field. At this level, it’s the kiss of death. You have to know how to catch ground balls well to keep playing, so I asked that he be moved. Coach Willie listened and put him at third for just about the entire season, except for a few instances when he needed someone who could play first. The Boy then had to learn to move in the infield, as opposed to just doing the same thing every play. It worked out as he became a better fielder and will continue to improve as he plays on. His hitting also improved. He was much more confident and hit for the highest average on his team. Prior to this year, many of his hits were without much juice on them and died in front of outfielders. His hits this year were strong enough to reach the gaps and go for extra bases. He hit two automatic doubles (where the ball bounces over the fence) and many more that simply found the gaps. It was a huge improvement. At the end of the year, Coach Willie told us that he would be coaching the Hooligans—the sort of “B” team for the league’s all-stars. He said The Boy would have a spot if he didn’t make the main team, which was a great fallback to have. He didn’t make the main team, but was more than happy to play Hooligans. We found out for sure last Sunday, and practice started Monday at 5. It went until after 8 each night until the first game on Thursday. At 8pm. In Gardnerville. South Gardnerville. Luckily, we had Friday off and my mom said we could stay with her on Saturday night in Carson. With a game each night of the weekend and one on Monday, we took the chance to not drive the one night. His team won their first two games by looking decent. The Boy had three hits the first night and drove a couple in while scoring twice. That was nice. The second game he struggled at the plate but was called on to pitch the final 2/3 inning and flamed two guys. The third game was a little less favorable, as Reno Continental got trounced by a Carson team that did not have all-stars. They put their best guys in Hooligans and it showed. 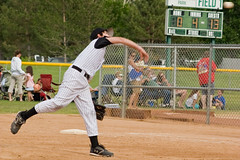 The Boy pitched a couple innings, didn’t walk more than one or two guys, but got raked. As did every pitcher they ran out there. A couple parents came up and told me that it was a legit shot that cleared a row of trees just behind the fence. Pete Ernaut, who happens to be one of the nicest people I have ever met, and I’m not kidding (we’ve had kids on the same team a few seasons) said, “If there was one kid on this team that deserved a home run, it was [The Boy].” We had been sitting through games with Pete and his family all season and he had coached The Boy a few years back. He knew him as well as anybody involved with the league. The game wound up going extra innings and Reno Continental won 8-7, making them the second seed in their division. That meant we’d be back the next night at, you guessed it, 8pm for a single elimination playoff game. It didn’t go well, so we’re back to normal now. Throughout the tournament, I noticed some things about my kid and some of the others. They had grown up a lot. It was really weird. Maybe it was because they were being recognized as good players. Maybe they felt like they were out of their comfort zone. Who knows? But they seemed like much tougher baseball players. Pitchers weren’t affected by the sometimes brutal calls behind the plate. Neither were batters. They played the game with the right kind of emotion—the elation of a good job done. They didn’t throw fits when things didn’t go their way. Heck, they didn’t even seem to notice when things didn’t go their way. It was a wonderful thing to watch. And I remarked on this to several parents who agreed. We got to spend five nights away from home, but with some other families who I really grew to like in that short time frame. What a cool bunch of people that had kids on that team, and what an awesome bunch of kids. Here’s to the 2008 Reno Continental Hooligans, who finished with a 3-2 record. And here’s to The Boy, who will never forget that home run (because we’ll frame it).